The federal Liberal leader brings his campaign to Fredericton and Sussex as Tories revive their attempts to link him to the premier's controversial policies. The Trudeau-Gallant connection is real, but there are signs it may have turned into a positive for the Liberals. Trudeau's decision to adopt Gallant's approach to deficits and infrastructure — spend now to create jobs, then balance the budget later — is widely seen as a turning point in his campaign. 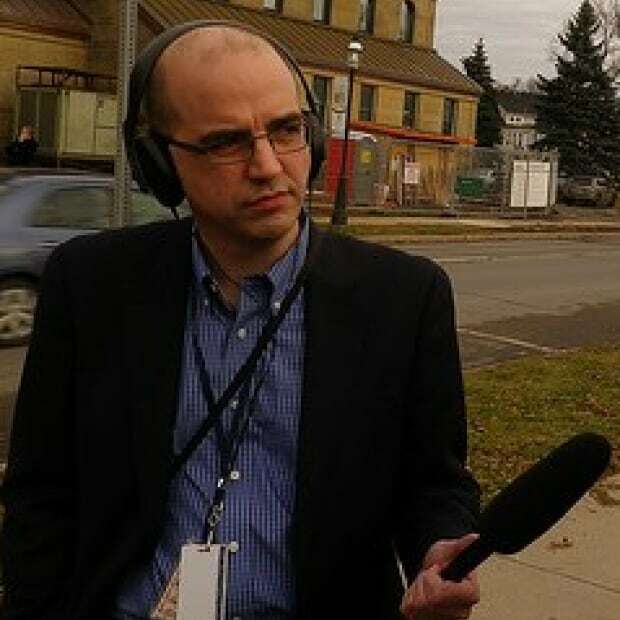 This week, Saint John Conservative candidate Rodney Weston launched a new radio ad reminding voters of Gallant's controversial policies on shale gas, seniors and education, including teacher layoffs. "And he's Justin Trudeau's biggest supporter," the ad says. "What does that tell you the federal Liberals have in store for New Brunswick? A vote for Justin Trudeau is the same as a vote for Brian Gallant." Meanwhile, in Fredericton, incumbent Conservative Keith Ashfield's campaign is distributing flyers that include a photo of the two Liberal leaders together. 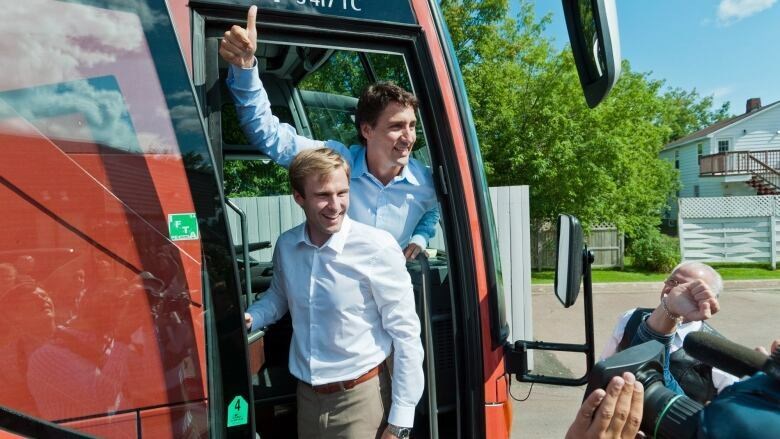 Trudeau shakes hands with Moncton East Liberal candidate Monique LeBlanc as Brian Gallant, left, looks on in Moncton during an August visit. (The Canadian Press)The flyer doesn't mention Gallant's policies but it cites Trudeau's plan to cancel some of the Harper government's tax breaks. Even before the campaign officially began, the Conservatives were running an ad with a senior citizen invoking Gallant's now-abandoned plan to make some seniors pay more for nursing home care. "Justin just doesn't seem to get it that New Brunswick seniors are already being hit," she said to the camera. "Clawing back our tax-free savings account is the last thing we need right now." As recently as this week, there was an acknowledgement those attacks were working: Fredericton Liberal candidate Matt DeCourcey took out large newspaper ads to say Conservatives had "successfully misinformed seniors" that Liberals will cut their services. "Nothing could be further from the truth," he said. Some of the Conservative attacks are accurate: Weston's ad says Gallant's provincial budget "raised income taxes to the highest in Canada," a reference to his new bracket for high earners creating a total federal-provincial tax rate of 54.75 per cent. That top-bracket rate would increase even more, to 58.75 per cent, under Trudeau's proposed tax hikes on wealthier Canadians. Gallant himself underscored the perception he would be a drag on federal Liberal candidates when he declared in July he wouldn't campaign for Trudeau, though he couched it as wanting to stay above the partisan fray. But things seem to have changed since then, with the federal Liberals apparently deciding Gallant is not a liability. The premier appeared with Trudeau at a campaign stop in Bouctouche and he was with former prime minister Jean Chretien for a Liberal campaign event in Moncton. More significantly, Trudeau borrowed a key strategy of Gallant's 2014 campaign: putting job-creating stimulus spending ahead of balancing the budget. In last year's provincial election, the Progressive Conservatives were promising to balance the budget by 2018. The Liberals calculated that voters were more interested in jolting the moribund economy than erasing red ink. Gallant promised $150 million in infrastructure spending to spur job creation--with a balanced budget put off until 2020. He went on to win a majority government. Gallant's move was itself based on a similar gambit by the Ontario Liberals in their election earlier last year, a gambit that paid off with an unexpected majority win. In the federal campaign, Trudeau has now done something similar, saying he'd run "a modest short-term deficit" to pay for a major federal infrastructure program. That appears to have played a role in the Liberals breaking away from the NDP in public opinion polling. Bruce Anderson of Abacus Data wrote two weeks ago that the firm's samples showed Canadians who want a change of government were looking for "ambitious change" instead of "moderate change," and they tended to see the Liberals embodying that more than the NDP. "Thus far in this campaign Liberals have out-positioned the NDP among change voters," Anderson wrote. "For those who want ambitious change and to feel it soon, the Liberals have established stronger credentials." There is still some risk for Trudeau in adopting Gallant's deficit-and-infrastructure play, however. In New Brunswick, the first year of infrastructure spending hasn't exactly produced an economic turn-around. It may have prevented things from being worse, but the most recent unemployment rate, for August, was 10.1 per cent. Still, in the heat of the campaign, aligning himself with Gallant appears to have a greater upside for Trudeau than downside. After all, just 12 days before election day, his campaign using its precious time today to hit two ridings held by Conservatives. That's an indication the federal Liberals are not playing defence, but feel they're positioned to make gains in New Brunswick.